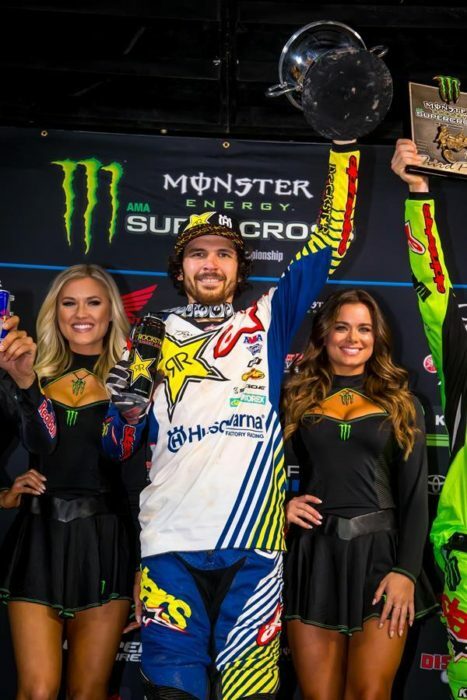 The Rockstar Energy Husqvarna Factory Racing Team faced the elusive Triple Crown format at the Atlanta Supercross, the ninth round of the series, held at the Mercedes-Benz Stadium in Atlanta, Georgia on Saturday. Three 250SX East Main Events and three 450 Main Events proved to be a grueling task for riders, but the Rockstar Energy Husqvarna Factory Racing Team was up for the task. Jason Anderson walked away with his first Triple Crown victory, while teammate Zach Osborne overcame adversity to put in a heroic ride and maintain his lead in the 250SX East championship. Dean Wilson had a steady night in the 450 class to finish eighth. Jason Anderson pulled a fourth at the start of the first 450 Main Event and was on the tail of Baggett in third. He made a quick inside pass in the third lap to overtake the third-place spot then started battling.. He made the pass stick the following lap and sat solidly in third. He inched closer to the top-two with three and a half minutes to go and got aggressive as he made the pass for second. He swapped positions with the leader in a spectacular battle amongst the top-six riders, then held his ground to finish second. He pulled his first holeshot of 2018 in the second 450 Main Event, rode his own race out front, and held his ground to the very end to take the win. He was fourth at the start of the third and final 450 Main Event and inherited third after Blake Baggett went down in the rhythm section in the second lap. He stayed focused and made the pass for second a few laps later, then went back to third after battling with Eli Tomac with just over seven minutes remaining in the race. Still holding the points lead on the night, he rode a smart race to finish fourth. The 2-1-4 finish gave him his first Triple Crown victory of the season and maintains his lead in the 450 championship. Zach Osborne was second at the start of the first 250 Main Event and waited for his opportunity to strike. His chance came with just over four minutes remaining as he took the lead after the leader went off the track. He stayed strong to take the first victory of the night. He was second at the start of the second 250 Main Event and quickly regained the position after falling back to third. He turned up the intensity and put on a charge before coming together with Austin Forkner and going down. He quickly remounted and rode smart to finish third. He was top-10 at the start of the final 250 Main Event but went down after getting caught up in a group of downed riders in the beginning of the race. The incident put him farther back in the pack with nine and half minutes to go. He had his work cut out for him, but knew what he was capable of. Filled with determination, he charged through the pack and put on a heroic ride to finish fifth. The 1-3-5 gave him second overall on the night and maintains his lead in 250SX East rider point standings. Dean Wilson was mid-pack at the start of the first 450 Main Event and made his way up to 11th with just over five minutes remaining in the race. He put in a charge and made two more passes to finish ninth. He was top-10 at the start of the second Main Event and rode a consistent race to finish 10th. He was mid-pack at the start of the final 450 Main Event and focused on moving through the pack. He charged up to 11th with a little over seven minutes remaining and continued to put in work. He made one more pass to finish 10th. The 9-10-10 finish gave him eighth overall on the night. He is currently 12th in 450 rider point standings. Teammate Michael Mosiman lined up for the first time this season in the 250SX East class. He rode hard and went 18-12-12 for 13th overall on the night.